Diane Henningsen heard the news in passing. A local man, only 47-years-old, was near death due to a stroke. Diane, a Frontline Operations Manager and Personal Banker at Choice Financial in Ellendale, knew the man. His name is Kyle, and he’s been a customer at Choice Financial for over 20 years. In fact, he and his parents own and work at the local car dealership next door. Kyle is an energetic guy; Diane always saw him running to and from their office. He was always on-the-go. Now, that same energetic guy was in an induced coma in a hospital in Sioux Falls, SD. That day at the post office, Diane saw Kyle’s dad. “How is Kyle doing?” she asked. Tears welled up in the man’s eyes. Diane felt the tears welling up, too. Diane came back to the office that day heavy-hearted, hurting for her neighbors. She talked with her co-worker, Holly Schlenker, and the two began brainstorming ideas on how to help in some way. 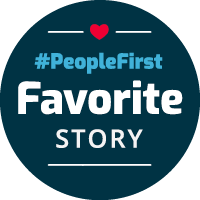 In Ellendale and PeopleFirst fashion, they began designing a gift basket. They knew that Kyle’s mom and dad were making the four-and-a-half hour trek to and from Sioux Falls as often as possible. So the first gift that came to mind was a gas card. They also included a few other snacks for the road; chips, trail mix, cookies. 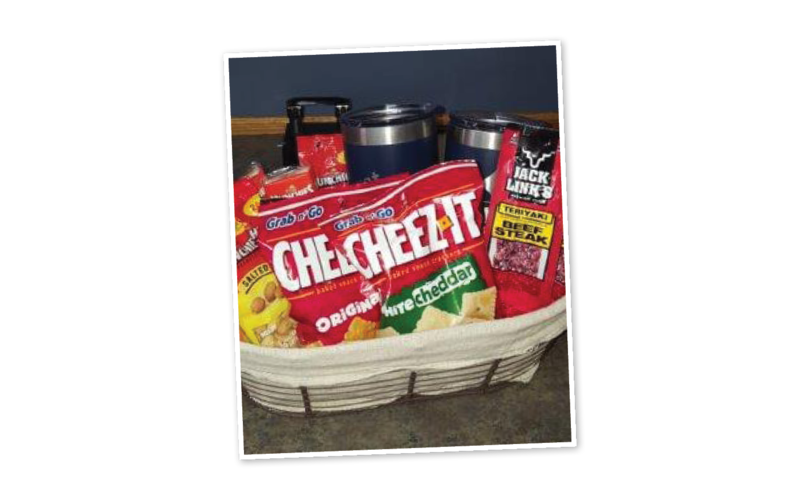 Gift basket put together by Diane Henningsen. The next day, Diane called the car dealership ahead of time to ask if Kyle’s parents were there. “Yeah, they’re here,” the secretary said. “Ok, don’t tell them I called. I’ll be over in a little bit,” Diane said. “Okay,” the secretary sounded confused. Kyle’s parents were not Choice Financial customers. They had no connection to the Choice Financial team, except through their son and the fact that they were neighbors. So when Diane showed up with the gift, they were completely taken aback. “I need to call my wife over here,” Kyle’s dad said, with tears once again in his eyes; this time it was a mixture of sadness and gratitude. Both of them thanked Diane multiple times with shaky voices. Kyle was still in poor condition, they said. But they were hopeful. To receive something like this just showed how much the community cared about their family. “I’m really glad we did it,” Diane said. Holly, too, was proud of Diane’s initiative and the wonderful affect that it had on the family. “When we have opportunities like that and follow through on them, I think it’s something that should be recognized,” she said. Thankfully, as time went on, Kyle began to improve. Four weeks later, he was able to come home. He started working two hours a day and going to physical therapy three times a week. He came into Choice the week he got back.